During mosquito season, it can be hard to imagine an end to all the flying pests who are terrorizing you and your family. When mosquitoes are constantly harassing you, their lifespan can seem impossibly long. If you’re curious about how long a mosquito can live to terrorize you, I have the answers. The first thing you should know when looking at the average lifespan of mosquitoes is that female mosquitoes live much, much longer than their male counterparts; they are also the only mosquitoes with the ability to bite you and drink your blood. Unlike many insects who have astonishingly short lifespans, a female mosquito can live roughly one or two months (which can sometimes be the entirety of a mosquito season). Armed with the knowledge in this article, you’ll be better able to understand a mosquito’s lifespan and what steps you can take to drastically shorten their reign of terror. The average adult female mosquito can live up to 42-56 days. That means a single female mosquito can potentially survive in your house for almost two months. Outside, mosquitoes will only live in temperatures over 50°F, but preferably 80°F. Adult male mosquitoes have a shorter lifespan, they only live up to 10 days. When it comes to dealing with mosquitoes, knowledge is power and knowing about their general lifespan and the different stages of their life cycle can give you an advantage against them. A single female mosquito can terrorize you and your loved ones for almost two months! On the other hand, adult male mosquitoes only have a tiny window of survival. Quite a difference, isn’t it? You may be celebrating the short male lifespan, but don’t get too excited: male mosquitoes’ only real goals are essentially reproducing and making sure they eat enough nectar to stay alive, so they aren’t the ones responsible for aggravating bug bites. In fact, male mosquitoes don’t even have the necessary anatomy to bite you and drink your blood. Instead, it’s the female mosquitoes you need to guard yourself against when mosquito season rolls around. Keep in mind, these rough lifespans are only applicable in ideal conditions and can vary from species to species. When you remove things like adequate protection, food sources, and places to lay eggs, you can drastically shorten a mosquito’s lifespan. Knowing how long they live and what stages of life they go through is a powerful tool in your arsenal against mosquitos. Continue reading to find where I break down the various life stages a mosquito goes through and how long they can live in certain circumstances. Did your elementary school ever keep class butterflies to learn about the various stages of their life cycles? If the answer is yes, you may remember how butterflies go through several different stages (and forms) before they emerge from their cocoons and are ready to fly. Just like butterflies and many other insects, mosquito’s life cycle can be broken into several different stages. The life cycle of your average mosquito can be broken up into 4 stages: egg, larvae, pupa, and adult. Let’s take a look at each of these stages and what they entail for a mosquito’s growth and life. The first stage of a mosquito’s life is the egg stage. When a female adult mosquito has recently finished feasting on blood, she will try to find a suitable area to lay her eggs. The ideal location for mosquito eggs is in stagnant or “standing” water. Places like unused birdbaths, old puddles, or untended ponds are wonderful locations for this; some species will even lay their eggs in damp soil that is prone to flooding, so a yard that has poor drainage may also be an ideal mosquito birthplace. When the female adult mosquito has chosen an adequate birthing location, she will lay her eggs one at a time. Depending on the mosquito’s species, her eggs will remain solo or they will attach to one another to form rafts of up to 200 individual eggs. Some species can even lay more than 200 eggs at a time! So long as things go well (ie, temperatures do not drop or the eggs are not destroyed), mosquito eggs will hatch within 48 hours. If all goes according to plan, the mosquito eggs will hatch within 48 hours and the mosquitoes inside will enter their second stage of life: the larval stage. Mosquito larvae (or “wigglers” as some people call them, due to their wiggling movements) must have water in order to survive. After they hatch from their eggs, the mosquito larvae will rise to the water’s surface so that they can breathe. Some larvae will have siphon tubes so that they can breathe as their bodies hang underneath the water’s surface; some will lie parallel to the water’s surface to breathe through an opening in their bodies. Other species may even attach to aquatic plants so that they can stay rooted as they breathe and grow. However they go about it, the mosquito larvae will find a way to breathe above surface while staying submerged in the water to remain protected. They will live within the water from anywhere as long as four to fourteen days. During this time, they will shed (or molt) their skins at least four times and grow larger as they continue to molt. While they molt, the larvae sustain themselves by feeding off of aquatic microorganisms or any organic matter that is within the water. When the larvae undergo their fourth and final molt, they will transform from a larva into a pupa so that they can enter the next stage of their life. The third stage of a mosquito’s development following its life as a larva is known as the pupal stage. In most mosquito species, the pupal stage will last roughly two days. Unlike before where the mosquito could only wiggle in the water without really going anywhere, pupae have the ability to be mobile. They are able to move by tumbling around in the water with their tails. They do so in order to respond to light changes and to seek protection. During the pupal stage, there is no need to feed. Instead, mosquito pupae spend their time resting and preparing to become an adult. Remember earlier when I mentioned butterfly’s and their life stages? It is during the pupal stage that mosquito pupae undergo a metamorphosis similar to the cocoon stage of a butterfly’s life. After the pupae are done growing and changing, their bodies’ outer skin will split open and their adult mosquito forms will emerge. After emerging from their pupal shell, the adult male mosquito will spend a short time resting on the surface of the water he grew up in. This rest will allow all parts of his body to finish hardening and will also give him time to dry off so that he can fly. His wings will need to unfurl and dry fully before he is able to fly. During the first few days of his adult life, the male mosquito won’t be interested in finding a potential mate. Instead, he will be focused on his finishing development. Unlike the female mosquito, male mosquitoes feast only on nectar and other sources of sugar to sustain themselves. Following his final developments over the initial few days of his adult life, the male mosquito will likely seek out plant life in order to feed himself. After he is full, he will set out to complete his true goal: finding mates to continue his species. Male mosquitoes will spend the entirety of their short lives mating with females. Some male mosquitoes will form swarms in order to attract mates, while others will seek out their partners solo. Either way, the male mosquito will do all that he can to find as many female partners as possible to ensure the continuation of his kind. After roughly 10 days, the male mosquito will have come to the end of his natural lifespan and he will die. The start of the adult female mosquito’s life is almost identical to that of her male counterpart. After she sheds her pupal skin, the adult female mosquito will spend her first few days resting on the surface of the water she was born and grew up in. The softer parts of her body will finish hardening and her wings will stretch out and prepare for flight; this time on top of the water will also allow her body to dry so that she can take flight. It is crucial for a mosquito to fully dry off before they attempt to fly, as they are unable to do so if their bodies are wet. During these first few days, she won’t seek out food and will instead focus on preparing for the days ahead. After the adult female mosquito’s body is fully functional and she is no longer wet, she will take flight and begin hunting for food. The adult female mosquito also sustains herself on a diet composed of nectar and plant juices. However, whereas male mosquitoes do not have the proper anatomy to drink blood, female mosquitoes do. Along with her nectar drinking, the female mosquito will supplement her diet with blood so that she gains the proper nutrients needed to bare and birth eggs. Let’s take a look at the anatomy female adult mosquitoes develop that allows them to harvest blood, so that we can better understand how drinking blood plays a part in the adult female mosquito’s life. The female mosquito’s mouth is known as a proboscis. It is a sort of sophisticated tube that contains a system of thin needle-like parts that allow her to pierce skin, seek out blood vessels, and drain their contents. When a female mosquito goes to puncture flesh so that she can fead, the outer lip-like sheath (known as the labium) of her proboscis rolls up to allow the needle-like parts inside to pierce the flesh. There are six different needle-like appendages known as stylets that are needed for the female mosquito to be able to drink blood. The first two stylets are called maxillae and they contain tiny, sharp teeth that are used to saw through skin. These teeth are so sharp that the mosquito can get through your skin so quickly and easily, you probably won’t even feel the sting of the bite. After the maxillae have done their work, another set of stylets called the mandibles hold the skin apart. The mandibles allow the mosquito to get past your skin without needing to bite over and over again. The fifth stylet needed is known as the labrum. The labrum probes beneath the surface of your skin to find a worthy blood vessel. After the labrum has found an adequate vessel, it pierces through with a sharp tip to begin draining blood. After the mosquito has filled her pouch up with blood, the final stylet gets to work. The hypopharynx stylet pumps saliva into the bite wound. The mosquito’s saliva prevents proper blood clotting, so the mosquito can return in the future and continue feeding without needing to establish a new feeding spot. The saliva also dilates blood vessels and works to block your immune system’s natural responses that would respond and destroy the intruding substance. A mosquito’s saliva also lubricates their proboscis, which will allow for future feedings. Unlike male mosquitoes whose main interest is mating with as many partners as possible, female mosquitoes will typically only mate with one male in their entire life. After successfully coupling, the female mosquito will store sperm inside her body so that she can continue to fertilize her eggs over the remainder of her life. In order to give birth, a female mosquito has to feast on blood in order to gain necessary nutrients. Once she has had a blood meal, she is ready to give birth. Typically, a female mosquito can lay one set of up to 200 or more eggs every time she feasts on blood. After one or two months, the female mosquito will have worn out her body’s potential. Her life can be shortened by cold temperatures, over-exposure to sun, lack of food sources, or outside factors like mosquito sprays or other bug killers. After the female mosquito has drunk as much blood as possible and laid as many eggs as she can, she will die. However, all of the offspring she gave birth to will continue the pesky cycle of mosquito life. Now that I have addressed the typical life stages a mosquito will go through during their natural lifespan, it’s time to discuss the lifespan of a mosquito in varying circumstances. When all ideal requirements are met, an adult female mosquito can live up to roughly two months. However, life for a mosquito is not always ideal and there are things you can do to prevent a mosquito from living up to their full potential. There are also environmental factors that can affect a mosquito’s lifespan. Let’s look into a few situations that can possibly affect how long a mosquito will live. Female mosquitoes are the ones doing the biting, and they will continue living even after biting someone. Mosquitoes are able to bite multiple victims: If they are able to avoid being killed in the biting process, they can potentially live as long as three weeks after the initial bite. An impressive post-bite lifespan! Some people are under the impression that after an insect bites or stings you, they will always die. While this may be true for bees and bee stings, it is not true for mosquitoes and mosquito bites. A mosquitoes anatomy is composed in such a way that biting and draining their victims of blood does not personally harm them. 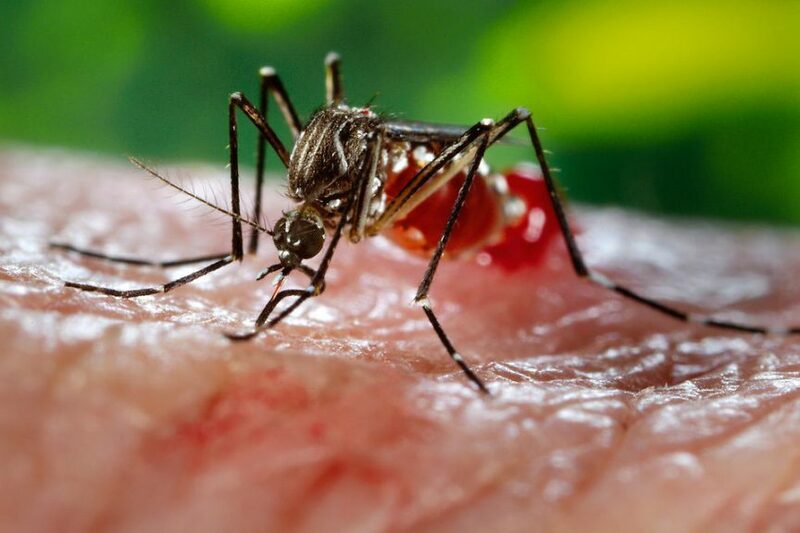 Just like how humans can eat a meal without dying afterward (unless there are special circumstances), mosquitoes can bite and drink as much blood as they desire over the course of their lives. Unless a mosquito is crushed after biting someone, they will live on to continue terrorizing innocent victims with their aggravating bites. How Long Do Mosquitoes Live Without Water? Mosquitoes are able to live without water only in the final stage of their lives (adulthood). On average, adult mosquitoes live outside water for up to two months for females, and about 10 days for males. However, female mosquitoes still require water to lay eggs, which they do every three days of their adult life. This question can be a bit complicated to answer correctly. For the sake of clarity, let me address it in two parts. First, let’s look at the survival of mosquito eggs, larvae, and pupae without water. After that, we will take a brief look at the adult life of these blood-sucking monsters. As I detailed above, mosquitoes require water during their first few life stages in order to grow. Mosquito eggs cannot survive without some form of water as they will quickly dry out (especially in areas of direct sunlight) and die. Mosquito larvae and pupae both require water to protect themselves as well and they survive on the nutrients coming from microorganisms and organic matter found in the water. Without these supplies, they will also die. In less than 24 hours without water, a developing mosquito will perish. Adult mosquitoes are a bit trickier. They no longer need water to protect themselves from environmental factors and they have developed a diet outside of the nutrients water can provide. The only need an adult mosquito has for water is to stave off dehydration and they can go a short time period without needing to rehydrate. In short, a mosquito can survive one or two days without water. However, if a female mosquito has fed on blood recently, she may survive up to four days without water. How Long Do Mosquitoes Live Without Eating? Because mosquitoes will ‘hibernate’ during winter (diapause), most female mosquitoes are able to live without eating for well over six months. In their active lifetime, an adult mosquito will technically not eat at all, but drink nectar. They can survive without nectar for 4 days, but only 2 days without water. Typically, an adult male mosquito could survive one or two days without eating. If an adult female has fed on blood recently, she could survive up to four. However, some species of mosquitoes do have the ability to hibernate. When temperatures began dropping under 80 degrees (and ideally, under 50 Fahrenheit), mosquitoes will begin preparing for hibernation. Only female mosquitoes can withstand hibernation as the male mosquito’s body is not strong enough. When preparing for hibernation, a female mosquito will overindulge on blood and fatten up as much as possible. After she has adequately prepared, a female mosquito can hibernate until the weather begins to warm up to ideal temperatures once more or up to six months. That means a female mosquito can go up to six months without eating. Of course, mosquitoes only go into hibernation if the temperatures are dropping. If a mosquito is trapped without a source of food, they will perish by the four-day mark. Mosquitoes require a warm environment in order to sustain themselves: indoor life is perfect for them. The average adult female mosquito can live up to 42-56 days. That means a single female mosquito can potentially survive in your house for almost two months. Without access to water and nectar, this will be less. The length of time a mosquito can remain alive indoors depends on a variety of factors. If there is available sustenance and the environment is not hostile, it is feasible for a mosquito to live out its entire natural lifespan indoors. However, most of our homes are not a suitable environment for mosquitoes since we may use products that can kill them or there may not be enough sources of food. Let’s discuss the various factors that can shorten (or increase) a mosquito’s lifespan indoors to better find an answer to this question. The longer they are exposed to cool temperatures, the quicker they perish. If you keep your house in the 60 or 70s Fahrenheit (roughly room temperature), a mosquito’s lifespan can be cut in half indoors. In summer time it can be warmer inside your home, making it more likely for these insects to survive for longer periods of time. As mentioned before, mosquitoes require adequate food sources to survive indoors. It is more likely a male mosquito will die off inside quicker than a female mosquito. This is because male mosquitoes only feed on nectar and other sugary plant juices. If you have no indoor plants and they cannot find adequate nutrition, expect a male mosquito to die off within a day or two. Female mosquitoes, however, can feed on blood. If you or any of your loved ones (including pets) can provide a food source for a female mosquito, she can live without a problem indoors. There are also protective measures you can take that will shorten a mosquito’s lifespan indoors. If you use any sort of protection against mosquitoes, their lives will be shortened. Things like essential oil diffusers, mosquito repellant plants, or other protective measures can put an early end to their reign of terror. In conclusion, there is no set answer for how long a mosquito can survive indoors because it depends on a variety of factors. However, if a mosquito is trapped inside with lower than desired temperatures and they cannot find food (either because there is no nectar or because you and your family members are adequately protected), expect four days to be the maximum for a mosquito’s indoor life. How Long Do Mosquitoes Live Without Blood? 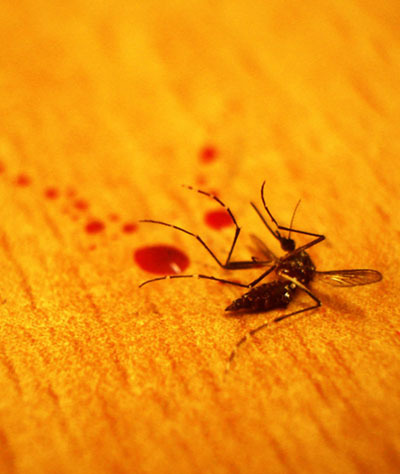 An adult male mosquito lives his entire life without feeding on blood. This is because his anatomy is simply not suited for biting and drinking blood. Therefore, he can live roughly ten days without blood (a normal adult male mosquito lifespan). When we consider the adult female mosquito, things get tricky again. If an adult female mosquito has fed on blood recently, she can survive up to four days without feeding again. However, like their male counterparts, female mosquitoes can also feed on nectar and plant juices. The reason female mosquitoes feed on blood is less for survival than for gathering the necessary nutrients to lay her young. If a female mosquito can find other food sources, it’s possible she could also live out her full lifespan or roughly two months. However, she would be unable to reproduce and this could shorten her life. The true answer is a grey area, so expect anywhere from four days to a month without blood to kill a female mosquito. Were you surprised by any of the information in this article? I know when I first discovered that adult female mosquitoes could live up to two months (and longer if they went into hibernation,) I was shocked! It is interesting to learn about the various life stages a mosquito goes through before they mature and to learn how merely denying access to stagnant water can end a mosquito’s life before they can even mature enough to feast on your blood. Hopefully, this article has helped you better understand mosquitoes and you have an idea of the steps you can take to keep them from bugging you too much. If you don’t want your home becoming a potential starting place for a mosquito’s life this mosquito season, check out 15 ways you can keep mosquitoes out of your yard and put an end to the mosquitoes before they can develop into a problem. Luckily, there are tons of protective measures you can take that will reduce a mosquito’s life expectancy. Head on over to our recommended products page to discover ways that you can repel mosquitoes and shorten their lives. After you’re done reading there, please browse the rest of our articles to learn how you can fight back against mosquitoes and reclaim your bug-free warm weather. Mosquitoes may be able to live a long time, but a little bit of knowledge and application can keep them from bothering you and your loved ones.